Eagle Hill is the 1165th highest place in Ireland. As one of my local 100s, and in the final potpourri of summits put off along with the likes of Carrigleitrim and Barranisky (need I say more?!!) I had not expected much of Eagle Hill. How wrong I was! This little hill punches far above its weight and offers the climber ample reward. Just before the Hackestown GAA club, we took the road on the left signed ‘Woodside Bark’ which ends at a timber yard. There is ample parking on the right just before a high metal gate at weekends, but during weekdays when the business is operating, it might be wise to park in a lay-by further down the road. From the parking point the hill, with its prominent cross, looms ahead. According to mcrtchly, Eagle Hill is a highly tectonised granite outcrop that lies on a shear zone and is composed of predominately metamorphosed quartz which has resisted weathering leaving it raised above the surrounding landscape. It is perhaps best viewed from the north west, where a short section of steep cliffs lends it a dramatic profile. Crossing the high metal gate, we easily navigated our way though swathes of golden gorse and began the steep climb toward the very visible cross over a broken down barbed wire fence. In summer bracken might be an issue, but in mid-spring the ground was peppered with the delicate flowers of white cranesbill, wood sorrel and violets. 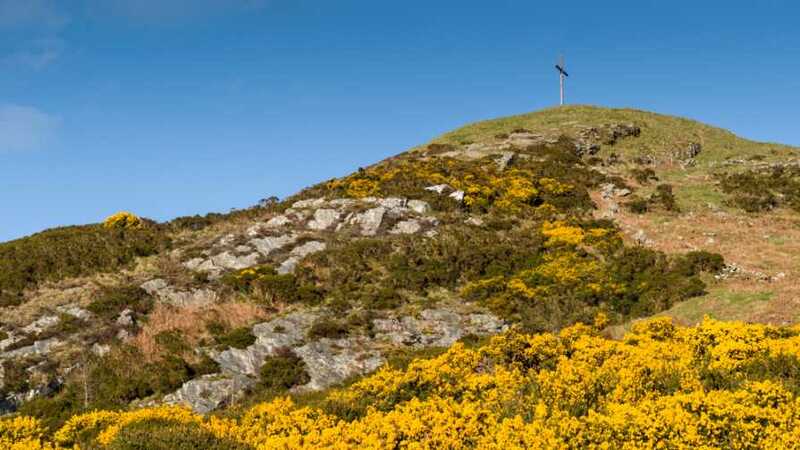 In addition to the cross commemorating Youth Year 1995 and which seems to be illuminated at night, the summit also sports a trig point and undoubtedly offers the finest vista of the southern side of the Wicklow mountain range, with fabulous views of Lugnaquilla and its South Prison. But that is not all. 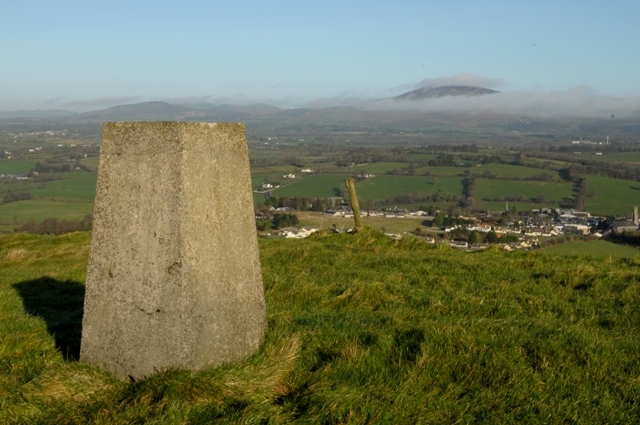 In fine weather Mount Leinster and the Blackstairs to the south are clearly visible, beyond which it’s possible to make out the smoky grey peak of Slievenamon in the Comeraghs. On the horizon to the west lie the Slieve Bloom range and south east is a delightful vista that includes Croghan Kinsella. For such a little hill, its summit views are fabulous. Not a big climb but wonderful views.